Occupation Freedom: Movement Music the Album is Now Available! Powerful, Raw, and Inspirational that Captures the Original Spirit of Activism, Love and Hopefulness at the core of Hip Hop Culture and Peoples Movements Everywhere. This is Movement Music. This is Hip Hop ! The album is now available on all the major corporate sites like Itunes, etc... but also through our Independent Virtual Store Front! We encourage that of course. Thank you for joining in the celebration and lets go! 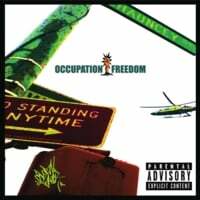 Here are videos for the first two singles from the album songs that helped to create the soundtrack for the global convergence movement known as Occupy Wall Street.